As we rush toward Thanksgiving this week, I’ve been thinking a lot about how to model and teach gratitude. During this past year of political and environmental turmoil, it’s often been difficult to pause and remember to be grateful for the many good things in my life. How can we help our kids experience gratitude? The answer isn’t a big surprise. Recent research confirms that parents who show gratitude are more likely to create experiences that develop a sense of gratitude in their children. It’s important to teach children not only how to express gratitude as a form of politeness but also to talk about how it feels to be grateful. Back in 2014, we learned from Nicole Haladyna how Austin’s Woodland Schoolhouse encourages empathy and gratitude through bonds with nature. We can also look for schools where gratitude is a part of daily rituals and make sure to put kids in situations where people talk the talk and walk the walk of gratitude during everyday life—family dinners, community yard sales, charity food drives, even birthday parties. Writing thank-you notes and taking time each day to list a few things for which they’re grateful are easy but proven ways to increase children’s understanding of what it means to be grateful. One interesting bit of information in the research is that both optimism and extraversion are strongly associated with gratitude. Extraversion seems to lead people toward the kinds of social activities with larger groups where it’s easier to demonstrate and learn gratitude. And optimism tends to lead people toward activities where they can make the world better, which then boomerangs back and increases gratitude. Because gratitude is such a bedrock part of most religious traditions, parents who are involved in organized religion also seem to increase opportunities for children to feel and understand gratitude. For the past five years, a psychology project of the Center for Developmental Science, jointly run by the University of North Carolina–Chapel Hill, Duke University, and North Carolina State University, has specifically been working toward understanding the teaching and learning of gratitude. They’ll hold a conference about their insights on gratitude in January. So in the interest of my own survival: Thank you to everyone who is part of the Alt Ed Austin and Alt Ed NYC communities online and in person, including my sister Teri in Austin and Karen Sullivan in New York, who let me contribute from afar. I’m grateful that I had a chance to meet so many of you a year ago at the 5th Anniversary party, and I look forward to meeting more of you next time I’m in Austin or New York! Happy Thanksgiving! How should a four-year-old spend her day? Nicole Haladyna has a great passion for the outdoors and has been teaching in natural environments for years. She founded the Woodland Schoolhouse, where she is currently enrolling children 3-1/2 to 5 years old. 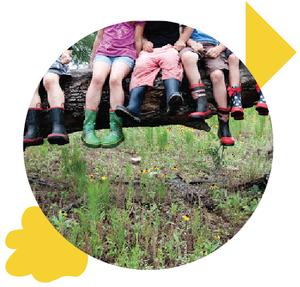 In this guest essay for Alt Ed Austin, Nicole provides a sparkling window into the world of Woodland kids. The morning after the downpour, we hike to our favorite creek and check out “our waterfall.” The air is fresh and damp. Some of us sit in a meditative-like state, arms wrapped around knees, watching water flow over rocks. Some scale the surrounding embankments seeking a higher perspective. Others crouch, carefully collecting small fossils or making fairy houses. Whispers and giggles are muffled by the moving water. We notice the discarded insects beneath a spider’s web and ask each other “How?” and “Why?” Then we retrieve our sketch pads and draw what we see. We shake wet branches and pretend it’s raining as their leaves empty upon us. New discoveries are always welcome, but there is something more profound about knowing a place. Really knowing a place. In our short lives we’ve been here so many times—not just visited but been here with all of our senses. We’ve felt this place weather the seasons. We know its sounds when brisk or icy. We know its voice when the air hangs still and hot. We’ve crunched on its leaves, sipped its raindrops. We’ve watched its caterpillars descend from the trees and reappear as delicate butterflies and moths. We’ve buried our hands in this gritty soil. We’ve dipped our bare feet in these creeks. We’ve observed how buds spring from the tiniest twigs and transform into lush leaves in only a matter of days. We’ve snuck up on deer—so many deer!—beneath our special tree. We’ve discovered their bones beneath the fallen leaves. We witness signs of birth and death every day, and we embrace it all. We seek to understand it all. 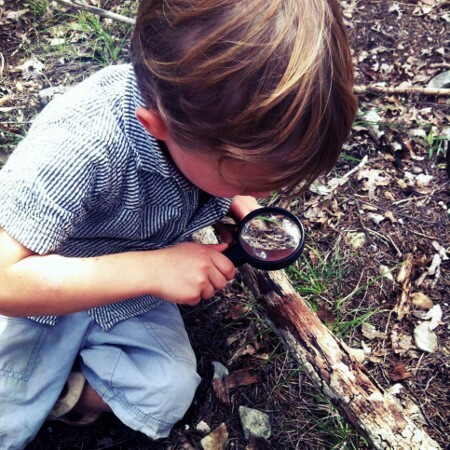 Every child deserves to have such an intimate relationship with the natural world. This sense of place does not develop through periodic field trips but with learning and loving one place first. Holding and protecting a place and its inhabitants so dearly, knowing it isn’t yours at all: this is the most beautiful lesson in sharing, empathy, and gratitude. Much of our curriculum at Woodland Schoolhouse derives from our inspirations, and in this place, inspiration and wonder envelop us. There are countless creatures, relationships, landforms, and concepts here worthy of in-depth study. We re-create our findings in paint, clay, pencil, and more. We document our questions and make a plan for learning answers. In pursuit of these higher objectives, unintended lessons abound. We bump into each other, intellectually and physically, and practice navigating these conflicts constructively. Without the rigid time constraints so often present in a preschool schedule, we take our time and really get to the bottom of the issue. We’re eager to master basic mathematical concepts when they’ll help us confirm exactly how many tadpoles are here today versus last week, or how high that deer had to reach to eat the fruit from that branch. Writing is meaningful when we’re drawing and labeling animal tracks we’ve discovered or dictating a letter to our grandmother about the bird’s nest we found . . . and how we can’t wait to see her again. We do not need to be pushed or coerced into learning. We must be trusted, supported, and inspired. Can you think of a better way for a four-year-old to spend her day?